Take a deep breath, you are on your way to writing the perfect nursing resume. Nursing is one of the fastest growing jobs on the market and registered nurses are in high demand. So, why would you need to worry about your resume? There are plenty of jobs to go around. You’ll snag one even if you send the most generic resume possible to the nearest hospital. Right? It may be easy for nurses to find job openings, but it’s still a good idea to optimize your resume before applying. See, most nurses, like you, are well qualified.Taking the time to optimize your nursing resume gives you an edge over the competition. A nursing resume example better than 9 out of 10 other resumes. How to write a nursing resume that will land you more interviews. Tips and examples of how to put skills and achievements on a nursing resume. How to describe your experience on a resume for a nurse to get any job you want. 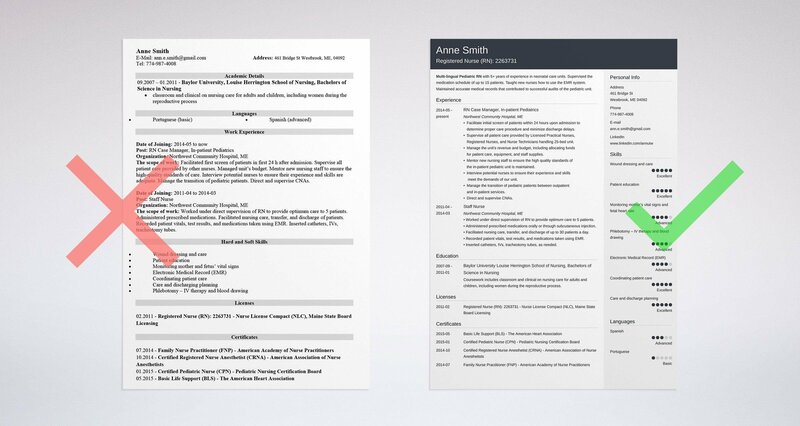 Here's a sample resume for a nurse made using our resume builder. Nursing Resume Examples - See more templates and create your resume here. The nursing profession operates in a fast-paced environment that values protocol and sanitation. So, it’s important that these values are evident in your resume. 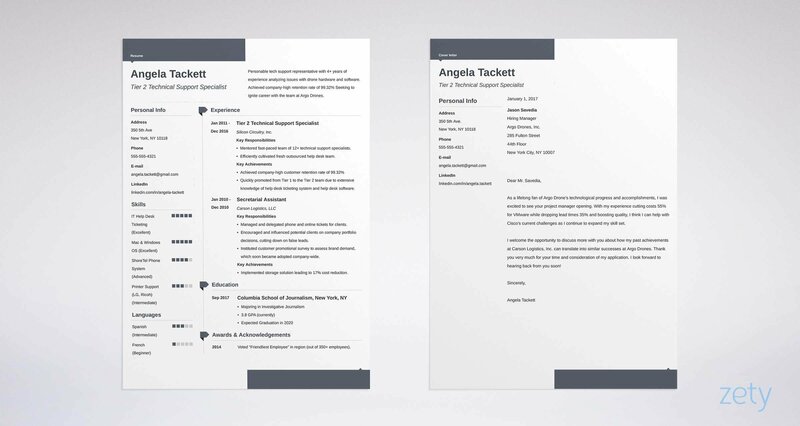 Choose a traditional format like the reverse-chronological resume format. Such a format places emphasis on your experience and education. Also, go with a layout that makes good use of white space and easy-to-read subheadings. And be sure to choose a classic, legible font. Unless instructed otherwise, save your resume as a PDF to preserve the layout. Use your complete name and job title to name your file. And consider adding your license type and number. Many recruiters still receive applications from under-qualified applicants. That’s because a surprising number of people send resumes without reading the job description. That’s why recruiters prefer seeing licensure information before reading through an entire resume. It saves them time, so they don’t have to read resumes that don’t meet the requirements. Should you write a nursing resume objective or summary statement? Are you a fresh graduate, career changer, or a nurse looking for a niche or specific role? Then you should choose an objective for a nursing resume. Resume objectives are for applicants who don’t have a lot of on-the-job experience. Dependable licensed RN trained to work in high-stress environments and stay calm under pressure. Seeking to leverage meticulous record-keeping and analytical skills to gain experience as a Nurse. Newly licensed RN looking for a challenging nursing role in a medical facility where I can put my skills to the test. Applicants with experience in the industry should use a resume summary. Multi-lingual Pediatric RN with 15+ years of experience in the intensive and neonatal care units of a community hospital. Seeking to leverage management experience in the role of Pediatric RN at General Hospital. Pediatric RN with years of experience supervising the medication and health records of newborns. Pro Tip: A resume summary is also a good place to put your hours of availability. Nursing is a 24-7 job. Adding your hours of availability will help the hiring manager place you better. Especially if you’re applying for a general position instead of responding to a job offer. A nurse’s experience section is nothing like what you see on resumes for other jobs. In other professions, resumes are achievement-driven. Nurses must also include basic responsibilities to avoid getting screened out of a job. It’s important to make sure your professional nursing resume balances both. Nursing is a field with a ton of subspecialties. Listing specific responsibilities allows recruiters to know that you have the right skills. Let’s say your job title matches the title on the job description. Even then, the workplace setting might require different technical skills and certifications. Provided care for elderly Renal patients. Provided patient care. Once you’re done, go back and see if you can highlight any of your duties by adding an accomplishment. The recruiter will want to know if you have experience working in a similar sized hospital or unit that matches the prospective job. Have you ever worked in an Intensive Care Unit (ICU), an Emergency Room (ER), a Labor and Delivery Unit (L&D), or a Telemetry Unit (TELE)? Be sure to include the unit type under each job in your experience section. Also, include information about the admittance of trauma patients or overflow patients from other units. That way, recruiters know the type of patients you can handle. Listing the type of unit you’ve worked in illustrates that you have a particular set of basic skills. Nurses assigned to Telemetry Units work with patients that need constant monitoring. The critical nature of some patients suggests that the environment is fast-paced. TELE Nurses can handle several patients at once and deal with unexpected problems. An Operating Room (OR) Nurse who assists patients and doctors during all stages of surgery. Instead of handling several patients, an OR nurse handles one procedure at a time. Different facilities have different environments and daily tasks. Nurses also work with different equipment. So, a nursing home nurse is not going to have the same experience as a nurse working in an urgent care facility. Urgent care facilities are fast-paced with patients coming and going. Nursing homes have permanent residents that require long-term care. Both are demanding jobs. But the stamina, skills, and certifications are different. Let’s say you work in a facility for the elderly. You still need to add the type of facility to differentiate your skills. Let’s say you work in an assisted living facility. You don’t need to provide injury or illness-specific care for patients. But nurses who work in nursing homes do. That’s why it’s important to mention the type of facilities you’ve worked for in the past. Supervised all patient care provided by Licensed Practical Nurses, Registered Nurses, and Nurse Technicians handling a 25-bed unit. Interviewed potential nurses to ensure their experience and skills met the demands of our unit. Managed the unit’s revenue and budget, including the allocation of funds for patient care, equipment, and staff supplies. Conducted initial nursing assessments of new patient admissions. As you can see, the first candidate added the unit type (In-patient Pediatrics), the facility type (Community Hospital), and the number of beds (25). Once you move on to your education and qualifications, things can get messy. Nurses can end up with tons of qualifications and certifications. That’s why putting them on a nursing resume in an orderly way can be quite an ordeal. What should go where? Should you put awards, licenses, or certifications first? Should you list them in different sections or together? You don’t want to add too many section headers. Let’s say you only have one license. Adding a separate section for “Licenses” would be a waste of space. Good news. The American Nurses Credentialing Center (ANCC) anticipated the problem. So, they created a standardized way to list credentials. Your Education Section - Your education section should come first. It’s okay to put it before your experience section when you’re a fresh graduate. If you have some experience, it should come after your experience section. Your highest degree should come first on a nursing resume because it’s a permanent qualification. List your highest degree followed by lower degrees. If you have two equal degrees, list the most relevant one first. State Designations - These are certifications that give nurses the authority to practice at more advanced levels in specific states. Examples include Advanced Practice Registered Nurse (APRN), Nurse Practitioner (NP), and Clinical Nurse Specialist (CNS) certifications. Your Certifications - Any certificates that you’ve received or extra training should go in this separate section. Awards and Honors: Awards and honors can come from your time at school, from professional affiliations, from nursing organizations, or from previous jobs that you’ve held. Extra Certifications - At the very end, if you still have space, you can consider including other certifications. These would include non-nursing certifications that are relevant to the job you’re targeting. It’s a good idea to organize your resume according to industry standards. Recruiters are expecting resumes organized in a particular way. Conforming means they can find everything they want fast. Are you writing an entry-level resume for nursing? If yes, your education section will include your biggest achievements to date - your degrees. Consider putting your education at the top of your resume after the introduction. New grad nursing resumes will be short on experience. So, draw attention to your education instead. Are you writing a professional nursing resume after a few years of experience? In that case, you can put your education lower on your resume after your experience section. Regardless, always start your education section by listing your highest degree first. The name of your alma mater. The dates when you entered and left school. If you’re still at school, write “in progress” as your end date and add your expected date of completion. The location of your school. Your GPA if it was 3.5 and above. There are no hard and fast rules about how to order this information. If you went to a fancy school, you might want to lead with that. But the best nursing resume samples lead with the type of degree - BSN or MSN for example. That’s because nursing is a profession that requires you to have a degree. Recruiters will scan your resume looking for that particular information. Make it easy on them. When it comes to licensure, you’ve got two options. The first is to list your licenses in your education section after you’ve listed your degrees. That works best if you have one or two licenses. Otherwise, you can create a separate section for your licenses. Let’s say you decide to add your license to your education section. You can consider titling the section “Education and Licensure” instead of “Education.” That way recruiters know you’ve included information about your licensure in your education section. So, whether you’re making a registered nurse resume or a licensed practical nurse resume - location is the biggest issue. Once you’ve figured that out, the hard part is over. But how do you make a license entry on your nursing resume? Licensing State or Body: The state that issued you a license. License Name: The name you used on the licenses. License Number: You’ve already included this in your contact information, but it doesn’t hurt to add it again. Nurse Licensure Compact (NLC): If your license falls under the NLC, you’ll want to indicate that it does so. Having a license that falls under the NLC allows you to practice in states included in the agreement. That’s especially important for nurses applying for out-of-state jobs. License Expiration Date: The alternative is to put “Active Since” and add the month and year the license was activated. Pro Tip: License numbers are in the public domain. Recruiters can look up your number online via the State’s Board of Nursing website. Putting the number on your nursing resume saves recruiters time and energy. Show recruiters right away that you have the required licensure. That way they’ll know quicker that you’re qualified for the job. Win, win. Let’s say you have a certification to practice at advanced levels in a particular state. It’s important to put the name of that state on your resume. You can not just put that you are an Advanced Practical Nurse (APN). That’s because each state has different criteria for subspecialties in the nursing profession. Also, it may be illegal to use certain titles without permission from the state’s nursing board. Put the name of the state after your license information to show a state designation. Let’s say your state designation matches your license. Then there’s no need to include the same information twice. Let’s say that your Registered Nursing license falls under the Nursing Licensure Compact. Then it’s best to include the State Nursing Board that granted your designation. Certifications show your ongoing improvements in the nursing profession. They also show that you have specialized skills. Accredited and nationally recognized institutions issue certifications. Examples of such institutions include the American Board of Neuroscience Nursing (ABNN) and the Board of Certification for Emergency Nursing (BCEN). RNs are not required by law to get certifications to work in specific medical units. For example, you don’t need a Medical Surgical Nursing Certification (CMSRN) to work in operating rooms in many states. But many hospitals are willing to pay extra. Some at least focus on candidates who have this certification. Name of the Certification and the Acronym: For example, Advanced Cardiac Life Support (ACLS), Cardiopulmonary Resuscitation (CPR), and Certified Occupational Health Nurse (COHN). It’s always best to write out acronyms. You should never assume the reader knows all industry jargon. At the same time, acronyms are important for Applicant Tracking System (ATS) software. Be sure to include acronyms that you find in the job description. The Certificate’s Expiration Date: You can put the date that you acquired the certificate if there is it does not expire. There are tons of nursing certifications, and it’s impossible to list them all. So, here are two sources that can give you an idea of what’s available. The American Board of Nursing Specialties - includes a list of organizations and the certifications they issue. The Lippincott’s Nursing Center - includes the organizations’ phone numbers and email addresses. Awards and Honors can include recognition received from school, nursing organizations, social clubs, hospitals, and other healthcare units. List the name of the award, the awarding body, and the date received. Most of the skills you list should come from the job description. These are your resume keywords. They are also the skills that recruiters try to find while scanning your resume. But how do you know which skills are the most important? Sometimes the job description will tell you that a skill is desirable or mandatory. If not, you can try checking out other job descriptions like yours. You can also check out LinkedIn profiles of other nursing professionals. Look for repeated skills. You can assume that these are important skills for a nursing resume. What other skills should you put on a resume for nurses? Don’t be afraid to include relevant technical skills not mentioned in the job description. Don’t confuse computer skills with technical skills. Many hospitals are switching to electronic records. So, having computer skills can give you a leg up. Check the job description for specific types of billing or recording software. If there’s no specific software or program listed, include your computer skills anyway. That way you’re ahead of the game if they’re planning to switch to digital records soon. Technical skills aren’t limited to those that require extra certifications. Technical skills can include anything that a person without a LPN or RN license may find hard to do. Below is a list of skills for a nursing resume. Of course, the list isn’t exhaustive. Focus on the skills matching the position. This will give you an advantage over the other candidates. Especially in the context of a large skills gap in the healthcare sector. The chances are that you belong to a professional nursing association of some sort. That’s because there are thousands of affiliations for nurses. Some of them are academic affiliations. Others are national organizations or groups for specific kinds of specialists. Regardless, recruiters will want to know if your affiliation with any professional associations. Especially if you’ve received awards or held important positions within the organizations. The date the organization admitted you. Any offices that you’ve held. A description of your role within the group. Pro Tip: There are different ways to order such information on your resume. You don’t need to list the group you joined most recently first. It’s best if you order them according to prestige - personal and perceived. Put associations at the top if you held an office or had an important role. You can also lead with affiliations that have prestigious reputations in the industry. It is still necessary to write a cover letter. For a nursing resume, write a brief letter that focuses on your highest qualifications. Add a few accomplishments from your most recent job. Also, it is worth it to find out who will read your letter so that you can address it to that person. Some aren't sold on the whole idea of cover letters written for nursing resumes. They say it's a waste of time. But, at worst, it's a waste of 15 minutes of your time. The alternative? A wasted opportunity. Writing a short, customized nursing resume might be a challenge. But it’s possible if you do your research and use the right strategies. Only use a resume objective if you’re a fresh graduate or are changing specializations. Include your license type and the number beside your name and contact information. Include the number of beds, the facility type, and the unit type for each job you held. List your qualifications in the correct order: education, license, state designations, certifications, and awards and honors. Prioritize the skills mentioned in the job description. Proofread your resume and write a personalized cover letter. Do you have any questions on how to make a nursing resume? Let us know in the comments! 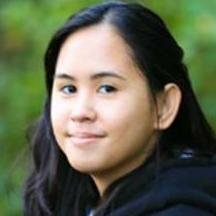 Charley Mendoza is a freelance writer covering career development and business. She's an expert in resume writing, interviewing, and negotiating, a topic she covers in publications such as Tutsplus, Business Insider, Brazen Careerist and more. A step by step guide to writing a professional resume for nursing student. Use our nursing student resume sample and a template. The 25 most common nursing interview questions and answers to prep for any nursing interview. Know what they’ll ask in advance and prepare for the top interview questions for nurses with a time-tested approach. Get your career off life support, walk into the nursing interview ready and calm, and land that dream job!